When performing repairs, there is often a desire to make fundamental changes in the redevelopment of living space. 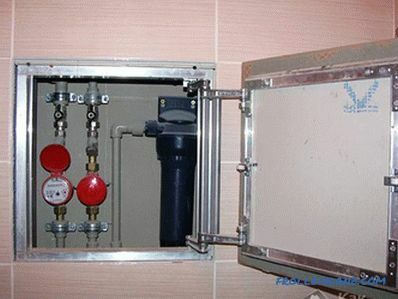 In this case, the question arises: how to determine the bearing wall, which can not be touched? And in order not to be mistaken, we suggest that you consider several ways to figure this out. Also, this article will be interesting to those who are planning to carry out repair work, namely, to lay communications in a hidden method. 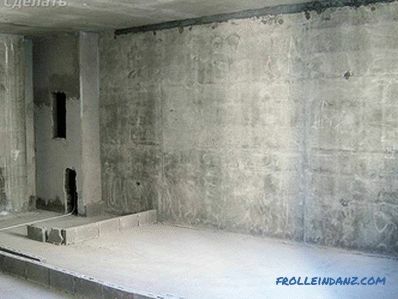 The supporting wall means the construction on which the floor of the next floor is supported. Also, such walls can be replaced with columns or beams that support the entire structure. 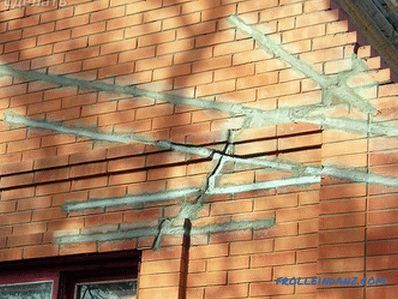 If during the repair process the carrier wall is incorrectly identified, then if it is broken, cracks may appear in the building, in the worst case, the floor may collapse. You can determine whether or not the load-bearing wall is in front of you in several ways. For example, by location. 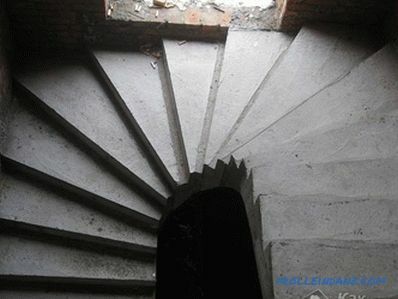 All exterior walls are always bearing, as well as those that are located on the side of the staircase. 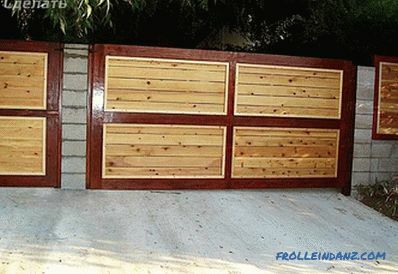 These can be walls that border your neighbors. In addition, you can determine by its thickness and what it is made of. 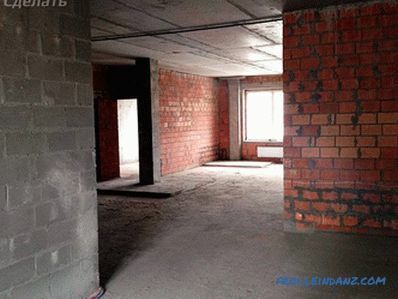 If a brick is used, then the supporting structure in this case will be greater than 380 mm. As for the reinforced concrete structure, it is 140-200 mm, and in the case of monolithic walls, the load-bearing wall will be 200-300 mm or more. 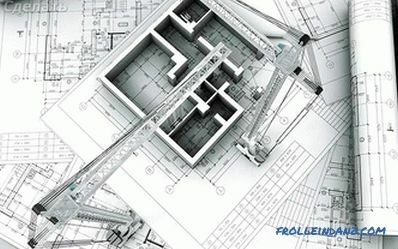 It is also possible to find the supporting structure by the arrangement of the floor slabs. All walls that are perpendicular to the slabs are bearing. Although there are houses where there are exceptions to the rules, for example, Czech buildings. These are key points to help you determine which of the walls are bearing and which are not. 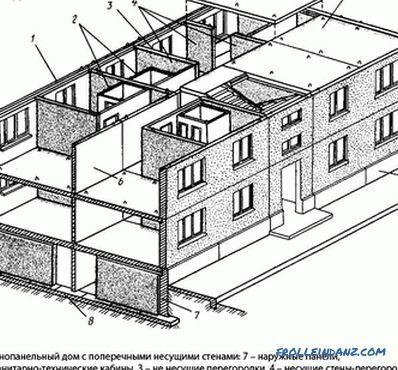 Now we will consider in more detail where and which walls in the panel house, the Khrushchev, brick and monolithic house. Partitions in a panel house usually have a thickness in the range of 80-100 mm. It can be made of gypsum concrete. As for the bearing wall, it can be 140, 180, 200 mm thick. If, after measuring the wall, its thickness is less than 120 mm, then definitely it is a partition. But notice the fact that in some panel houses the walls are plastered. Therefore, be sure to consider this when measuring. Although in most cases the layer of plaster does not exceed 50 mm, which means that it will not have a significant effect. But it is best to take the thickness of the wall as the basis for measuring. The thickness of the walls in brick buildings is formed during the laying. For example, a standard brick has a width of 120 mm. If the laying is done in two rows, then there is a joint of about 10 mm between them. Accordingly, the thickness of such a wall will be equal to 250 mm. If the wall is lined in three rows, then its thickness will be 380 mm and so on. 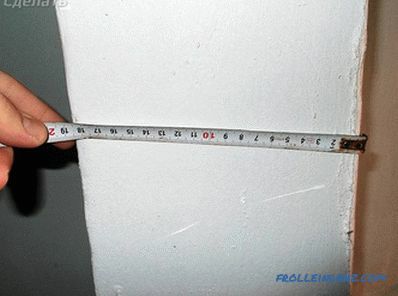 The simplest method for determining a bearing wall is measurement. Walls 80, 120 or 250 mm are partitions. Accordingly, the wall thickness of 380, 520 mm and more is always bearing. Also be sure to consider when measuring the layer of plaster and other finishing materials. 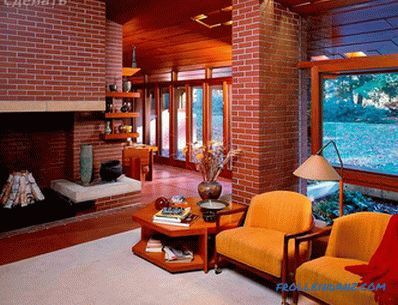 Some brick houses may have hardwood floors. Therefore, load-bearing walls may be of less importance. 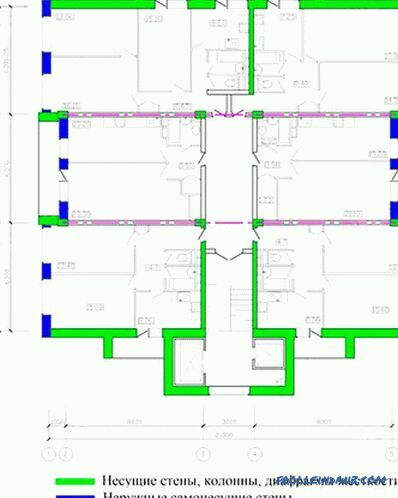 In this case, the partitions marked in blue are also carriers for the flight of stairs. As can be seen in this case standards apply. The design scheme in Khrushchev or Stalin does not change, although the layout of the apartment may differ. As for monolithic buildings, the layout of them may be very different. The thickness of the walls here can also be different, it is 200, 250, 300 mm and more. If the wall you have measured is 200 mm thick, then most likely it is a partition. If more than 200 mm, it is not a guarantee that you have a bearing wall. 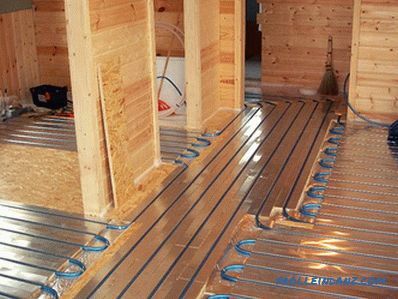 The very method of its determination is to find the project documentation or consult with an engineer from the developer’s company. 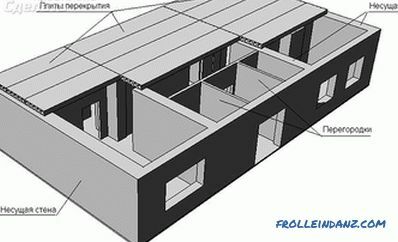 In monolithic houses for the partitions are used foam blocks of different thickness, this is all explained. 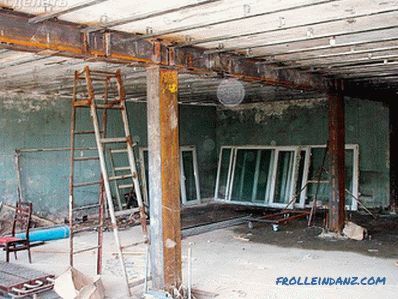 So, when redeveloping an apartment, there may be questions about whether it is possible to remove the bearing walls. Immediately it should be said that it is not allowed to dismantle it completely, as this may lead to the destruction of the structure. If, however, to make such a redevelopment without permission, then its restoration will have to spend a large amount, plus there is a risk of receiving fines. This rule applies to the carrying wall. can cause if there is no complete demolition or transfer of speech , and you want to make an opening, then it is possible to perform such work. However, each case should be considered individually and it is best to contact the project organization. 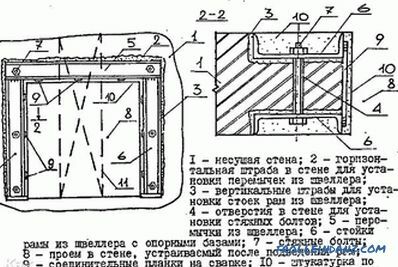 In that case, if you want to carry out certain communications using a hidden method in such a wall, it is prohibited to make horizontal or vertical grooves, according to the order of the Government of Moscow. 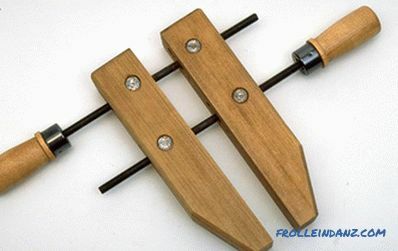 However, drilling is possible. Especially when it comes to installing fasteners, such as a dowel or holding sewer pipes, ventilation or water pipes through walls. 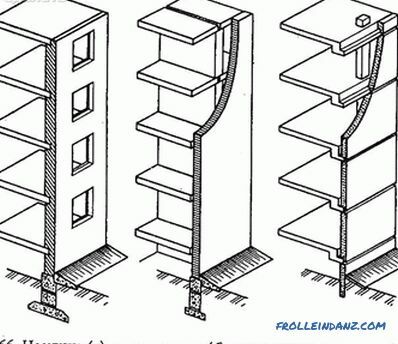 As you can see, there are a number of restrictions that apply to load-bearing walls. 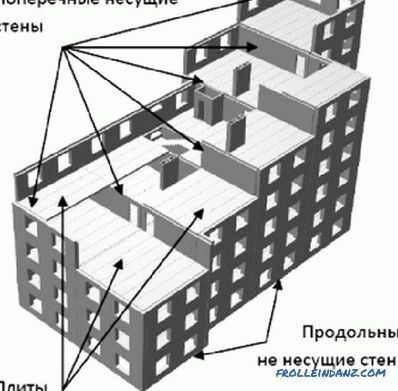 We hope that from this article, you received an answer to the question of how to find out the location of the supporting walls.